Austin Vantrease Parole: We Must Take Sides – We Got This! In 1986, Elie Wiesel gave his Nobel Peace Prize Acceptance Speech. The depths of his words never reached me until one night some 23 years later. It came in the form of a Facebook post from a person that my admiration has since grown exponentially. 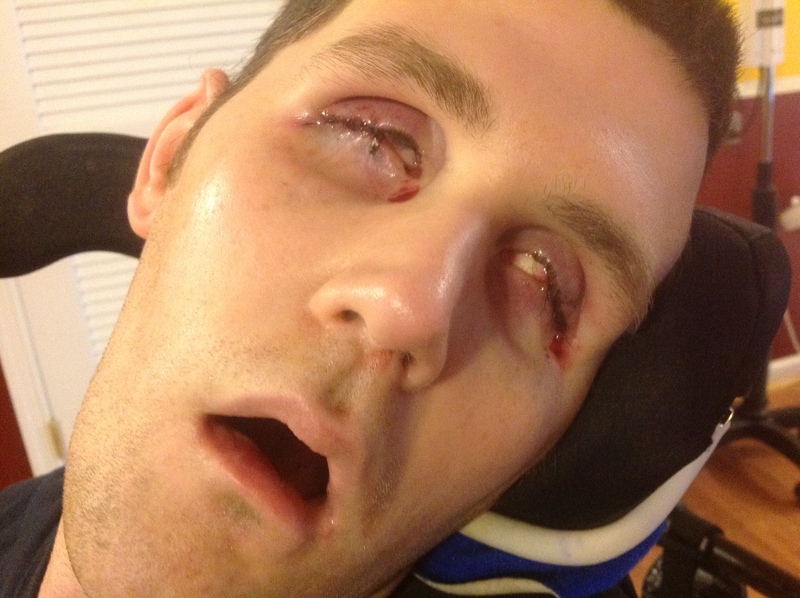 Since the day Ryan was brutally beaten, it seems like I met many such people. A WVU professor, Daniel Brewster, shared the words from this speech that stir me to this day. I not only can relate, in some ways I feel this surely must have been written for me, because it is better than anything I could ever write or say. It was a speech given to the world, for the world, and about the world, that interlaced the individual and humanity. I imagine myself speaking of Ryan. This inspires me to keep Ryan relevant. To never let people forget. I read this speech from a chair pulled up next to Ryan’s hospital bed in an ICU room in mid-town Atlanta. How many times since that day have I used those words as a battle cry? Thousands? Yes, at least that many. I leaned on these throughout the criminal trial. I drew from the wisdom as I spoke for Ryan at sentencing. I looked into the packed courtroom, with everyone (who mattered) crying and hoped I was doing my best to speak for Ryan. After all, I promised him before I left our home that morning that I wouldn’t let him down. I apply this insight — given over two decades ago in Oslo by Wiesel — often. It’s a noble and true principle. The truth within touches me everyday. Today is no different. Yes, we must interfere! Those who hurt and degrade don’t like people intervening. They prefer to lurk in the shadows of silence. It protects them. They do whatever they can to mute the noise. They’ll fight. They’ll invoke the legal system. They’ll further humiliate, embarrass, suppress, and mislead to keep things quiet. Think about it. I actually had to fight a restraining order to put a gag on my freedom of speech and protect this website. Oh yes, silence is sought by those who torment.At this point in time Ryan is best served with letters to the Parole Board. Silence will encourage Ryan’s attackers, never Ryan. Please, if nothing else, sign the online anti-parol petition. Equally true are Wiesel’s words that remaining neutral helps the oppressor, never the victim. We must always take sides. If you are on Ryan’s, please let the Parole Board know. Silence simply won’t work when further injustice is possible. Not now. Not ever. Do you need to see what injustice looks like in Ryan’s eyes? Maybe this photograph (below) from yesterday’s post will help. For Ryan, there certainly never will be complete justice; it’s not possible. We can only do our best to influence and reduce the injustice of Austin Vantrease being handed a “Get Out of Jail Free” card at the end of this month. I’m pleading with you to not be silent. Not this time. I look to you (and for you) to fight this injustice. Community sentiment is highly considered for Vantrease’s release. Given below is a sample letter that you can use as-is (just copy and paste) or add your own touch to it. Feel free to use any photos from this website. Then simply drop it in the mail or fax it over to 304-558-5678. It’s that easy! Please take the minute or two to do this. Please deny parole for Austin Vantrease, based on the violent nature of his crime. He kicked a defenseless man in the head, lying unconscious on the ground, with such force it was described as “like punting a football”. Instead of offering aid or requesting medical response, Austin Vantrease ran away and hid from the obvious life-threatening damage he caused. He was hoping not to be found accountable. His lack of remorse and retribution makes him a continued risk to the safety of the public and the Diviney family. Yes, I will be writing more letters, this time with photos and further dexcriptions of Ryan’s suffering together with that of the sacfirices and suffering that continues for the Diviney family. Thank you, God, for our pain and suffering along with and for Ryan, because this means he continues living on this planet with us. We are praying you well, Ryan. Believe it! Have just sealed the envelope to send to the parole board. The speech is incredible! I need a copy of that( I will try my hand at copy and paste…….and FYI, I put a “superhero” stamp on the envelope.) Always here in Wisconsin. I will do this today. Ryan is never forgotten. The suffering and sacrifices that Ryan and your family continue to endure every minute is unimaginable! How are we related? Through his mom’s side? Fighting is never a good thing, look what can happen!!! I sent my letter two weeks ago and this morning, I encouraged each member of the YGR group to also send a letter. I am so, so sorry that your family has to endure such unspeakable suffering. I have written the letter and it will go out in the mail today. While I don’t personally know you and your family, I have been following your blog and story for quite some time now. I can’t believe they are going to let him out! Ugh, how is that justice? I will share as well and get as many people to write letters as I can. You have my continued support! I hope Ryan is starting to feel better since his surgery. We WILL always be on Ryan’s side !!!!!!!!! Great Speech and seems like it does apply totally to Ryan!!!!!! Our letter went out in the mail a few minutes ago!! SHSP!! But after reading your post today — my soul is bursting with a hundred different emotions (and tears). Don’t worry, more people are writing on behalf of Ryan. And to all who don’t think it matters — please know, yes, it absolutely does…and Ryan needs and deserves your help. Thank you for caring about a wonderful young man who is depending on me, and you — on all of us. Lots of love, hugs, continued prayers for full healing, and for the blessing of faith in our souls, so that we can remain steadfast and strong in our mission to help Ryan. I faxed my letter earlier this week,and encouraged my younger son, a student at WVU to send a letter as well. We don’t know your family personally, Ken, but as a parent of two sons at WVU, and just as a mom, I cannot even begin to imagine your heartache, anger and frustration. I have been a regular reader of your blog and the boys and I often discuss Ryan and your family. My older son’s dorm room his freshman year actually faced the parking lot where Ryan’s attack happened. My younger son was a freshman the when Ryan was attacked and lived just a few blocks up the street from the Dairy Mart. I hate the thought of Austin Vantrease being released back into society. He is an evil product of his equally evil environment (aka parents/family) and should have to serve every single day of the maximum amount of punishment allowable by the law (I wish he could be given even more time). Calling all of Ryan’s classmates and friends! I wish to reiterate that it is so very, very important to send a letter to the parole board. Ryan needs you! I am personally asking that you send a letter. You are all young adults now, moving on with your lives, some graduated, some working, some doing a fifth year, and some going off to grad school. Consider what a blessing it is that you are walking around and able to speak your heart, Ryan is not so lucky. I know you are busy, but it does not take long especially if you use the form letter above. It would be helpful if you could add a personal touch, but, above all, just do this! Do it for Ryan; if things were reversed, he would do it for you. So, for anyone that we hosted at our home, fed, housed overnight, handed a pillow or a blanket, took camping, or just hung out with, please do this, do it for Ryan! I reached out to Prof. Brewster some time ago to thank him for his standing up for Ryan and for speaking out whenever and wherever there is violence, hatred and wrong doing. Until we can all do the same, many things will never change. I wrote my letter to the parole board weeks ago. I do not know Ryan or his family personally but I do know that I have a voice that can join Prof. Brewster’s and speak out when it is the right thing to do. I and my parents will both be mailing letters. Thank you for continuing to share Ryan’s story. Will defiantly write and encourage others. I have written a letter to the WV parole office…already have the envelope addressed and will place it in the mailbox today. Have confidence, Ken, that Vantrease’s parole will be denied, as it should be. ~Your unwavering dedication will make a difference. Just faxed the letter. Thoughts and prayers for you and Ryan. Just finished my letter and I will mail it tomorrow. Sending love, support, and prayers from Ohio! I sent my letter over, via fax, this afternoon. I graudated from WVU last year and remember this tragic event happening. This story has touched me in many, many ways. I send my love and support to all of the family and friends of Ryan. Your family has our vote. Fax’s sent successfully. Your prayers have been heard in more ways than one. God Bless you all ! Sent letter over by fax earlier , anything we can do to help! Just wrote my letter- I added the photo from Ryan’s surgery. Why should Vantrease be released to a normal life when he took the normal life of someone else. You whole family’s, in essence. I hope our letters keep him locked up for as long as possible. Always in our prayers. I hope Austin Vantrease gets released just to see the reaction on here. Although there is pretty much no shot he will get released this time I guarantee Austin will not serve 10 years, he will serve a little more then 5 years if he’s not paroled before that. I will be mailing a letter this week in support of Ryan and your family. A letter has been sent and daily prayers are shared for Ryan and your family. I made sure to share this post on my Facebook page. I hope it will bring more attention to Ryan’s struggle and I hope a few friends will take the time to write to the parole board. I urge more people to do the same. Praying for your family daily. I faxed a letter this morning. My thoughts and prayers are with your family…. As a member of the Morgantown community where Austin Vantrease (DOC# 51398-2) feloniously assaulted Ryan Diviney, I hope you will deny parole to Mr. Vantrease at his hearing later this month. This community is used to living with nearly 30,000 West Virginia University students, and we take what that brings in stride. But this attack was so much more than youthful hijinks or a mutual fight gone horribly wrong. After trying to disengage from a verbal confrontation that was clearly escalating, Ryan was “sucker punched” by Jonathan May, a friend of Mr. Vantrease. Then, while Ryan was lying unconscious on the ground, he was viciously kicked in the head by Mr. Vantrease. The kick was so deliberate and forceful it was “like punting a football,” according to an eyewitness. Following the attack, Mr. Vantrease and friends left Ryan nearly dead and went to a party, without calling for help. Since then, nothing in Mr. Vantrease’s words or behavior, nor those of his family and friends, has convinced me that he truly understands how heinous his actions were and the carnage he created. Until he does, and is deeply remorseful, I believe Mr. Vantrease will pose an unacceptable risk to society. Please deny him parole to hold him accountable, to provide a measure of justice to Ryan’s grief-stricken family, and to send the message to others that such actions are not tolerated in Morgantown or West Virginia. Well said Renie! Austin, Jon May, and the others involved along with their families still do not believe their actions were other than “boys being boys”. Their actions since the attack have demonstrated this. Their only regret is getting caught. God BLess Ryan and Family….saying prayers for all……. I’m on Ryan’s side! Still here still praying!!! That was an awesome article! It must be so hard to see him like this! I pray God will see Austin gets his share that he be put away for life! I pray for a blessing of healing! <3 your family is amazing! Prayers for Ryan and his family. Those who inflicted this cruelty should never be allowed back into society. zupeÅ‚nie przypadkiem tu trafiÅ‚em i po przeczytaniu komentarzy powstrzymaÄ‡ siÄ™ nie mogÄ™ od wÅ‚asnych 3 groszy:Ten dÅ‚ugi string komentarzy dowiÃ³dÅ‚ niestety prawdziwoÅ›ci Twojego postu, Trystero. Te dowody sÄ… niepodwaÅ¼alne i oczywiÅ›cie oczywiste. Ale wszyscy to jednak poczÄ…tkujÄ…cy spco-sktropiiiele, bo nikt nie zaczÄ…Å‚ drÄ…Å¼yÄ‡ wokÃ³Å‚ nazwy bloga. W koÅ„cu jasne, Å¼e W.A.S.T.E. PEACE BE WITH THIS FAMILY DURING THIS TIME OF TRADGEDY, PLEASE DO REALESE THIS WORTHLESS GARBAGE BACK INTO SOCIETY. HE WILL PROBABLY DO IT TO ANOTHER FAMILY. Sending prayers up for you Ryan and your whole family ! I have been sharing your petition with everyone . I truly hope you will get some kind of justice . Always know you have people thinking of you and praying for you .